Very small structures, much smaller than the human eye can see, often fall in the size range of nanometers (nm)—closer to the size of a molecule than the size of an object you can hold in your hand. By understanding how the molecules that make up these structures interact at this very small scale, we can engineer them to do many special things that cannot be done at a large scale. One exciting structure is a polymer brush, in which long, chain-like molecules called polymers are tethered at one end to a surface and stick up from the surface like bristles on a hairbrush (Fig. 1). These polymer molecules are more flexible than the bristles on a hairbrush, however. 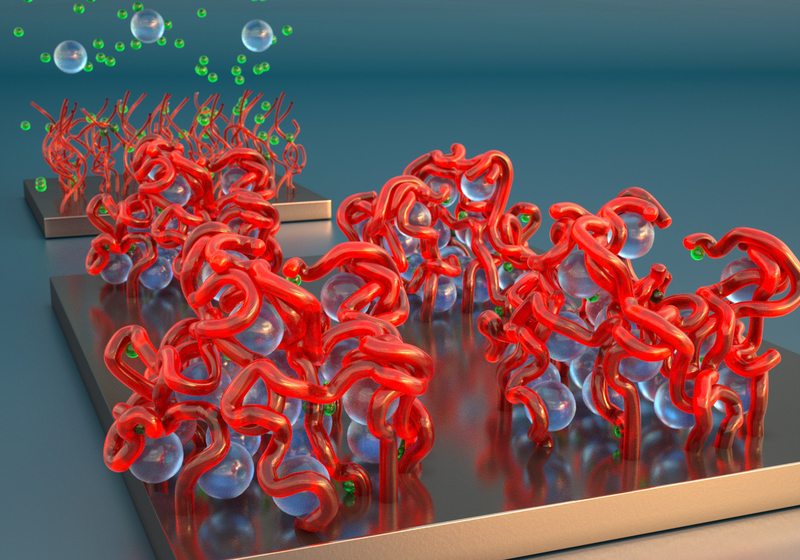 In responses to forces pushing or pulling them, they can tangle and collapse on the surface or they can stand straight up, giving the surface different properties depending on whether the molecular bristles are extended or collapsed. 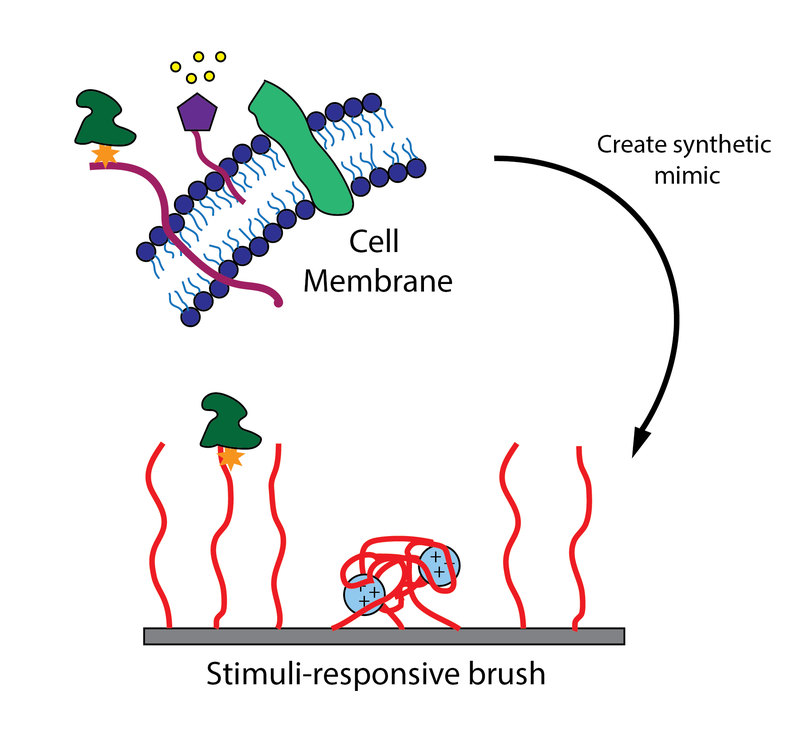 Polymer brushes can be used to keep bacteria away, provide an exceptionally smooth surface for items to slide across, or trap other molecules in solution like a hairbrush traps loose hair. 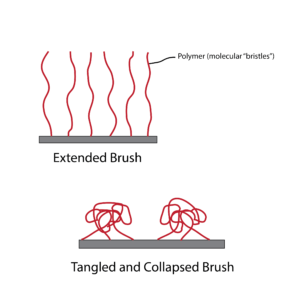 In order to engineer polymer brushes that will perform as desired for a given application, we must understand the physics of how the molecular bristles extend and contract, and the chemistry of how they interact with their environment. Researchers at Georgia Tech and the University of Chicago are using experiments and simulations to study how the long molecular bristles interact with a special type of ion with multiple charges, called multivalent ions, in water. 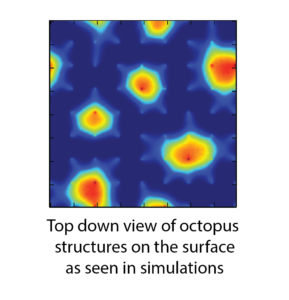 They found that, when more and more multivalent ions are added to the solution, the brush collapses into nanoscale, octopus-like features on the surface, as shown in the featured image above. If a different type of ion, each with only a single charge, is added to the solution, the large molecular bristles again extend away from the surface to take on a hairbrush structure. How do these two types of ions interact differently with the polymer brush to produce these different configurations? 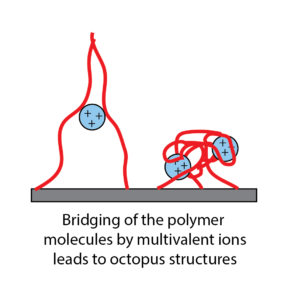 The researchers found that, because charged polymer strands (the molecular bristles) are attracted to oppositely-charged ions, the multiple charges in a multivalent ion allow it to attract multiple polymer strands at once, forming a bridge between these polymer strands (Fig. 2). 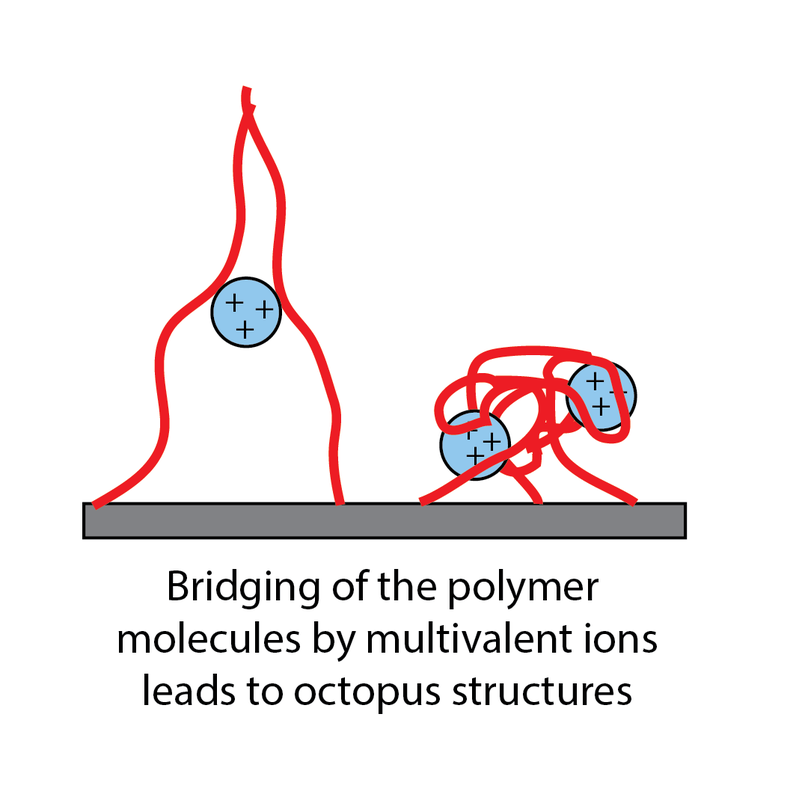 When enough of these bridges form, the polymers can no longer stay apart and extended, and they collapse into the octopus structures (Fig. 3). Whether a polymer brush assumes the extended hairbrush structure, becomes a film of tangled molecular bristles, or forms these nanoscale octopus structures depends on the stretchiness of the polymer chains on one hand, and the surface energy required to create the octopus structures on the other. 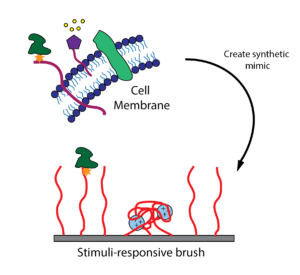 This research, showing how nanoscale structures are produced by molecular-level behavior in polymer brushes, is particularly exciting for applications where surfaces need to be “stimuli-responsive,” or adapt their behavior depending on what is going on around them. Many systems in the body, such as the cell membrane, are stimuli-responsive (Fig. 4). Engineers aim to create similar systems for use outside the medical field as well—for example, keeping bacteria off of a surface, providing lubrication between two surfaces, or filtering dirty water. Learning how molecules interact to produce nanoscale behaviors is critical to engineering and designing these new types of materials.